occupied Syrian territory, in line with United Nations Security Council (UNSC) resolutions. Until 1967, Golan Heights was part of Syria. Israel occupied the Golan Heights during the Six Day war (Third Arab Israeli war) held in 1967. Israel annexed the region unilaterally in 1981. This unilateral annexation was not recognised by the international community and the Golan Heights was seen as Occupied Syrian Territory. Why Israel wants Golan Heights? Golan's water resources and naturally fertile soil. United Nations Disengagement Observer Force (UNDOF) is stationed in camps and observation posts along the Golan. There is a 400-square-km (155-square-mile) "Area of Separation" called a demilitarized zone between the Israeli and Syrian armies. Further, Separation of Forces Agreement of May 31, 1974, created an Alpha Line to the west of the area of separation, behind which Israeli military forces must remain and a Bravo Line to the east behind which Syrian military forces must remain. 25 km beyond the "Area of Separation" on both sides is an "Area of Limitation" in which there are restrictions on the number of troops and kinds of weapons that both sides can have there. Q. 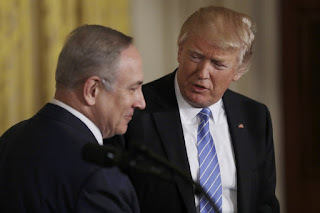 US President Trump has announced that the US will recognize Israel's sovereignty over which region?